A college basketball analytics blog. 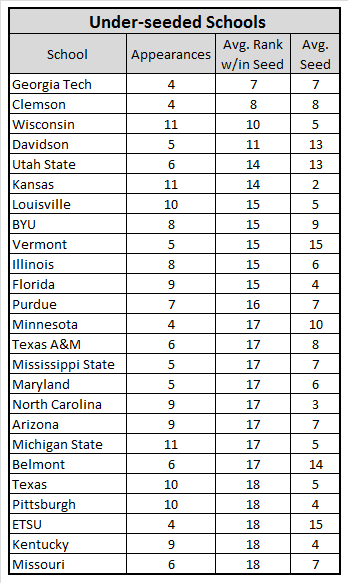 Based on curiosity alone, I wanted to know what schools were typically over/under-seeded in the NCAA Tournament during the Kenpom era. Below are some tables that show which schools are typically under-seeded or over-seeded. To arrive at these numbers, I looked at all of the 1-seeds, 2-seeds, etc. going back to 2003. Within each seed, the teams were sorted and ranked by their Pythagorean rating (1-44). So, the team ranked “1” was the strongest of its seed (1’s, 2’s…16’s) since 2003. Then I removed the schools who had fewer than four tournament appearances. Of the teams remaining, I looked at the average rank within a team’s given seed to determine how often they are under/over-seeded. For example, Georgia Tech was – on average – the 7th best team since 2003 within their seed, thus making them relatively under-seeded as a basketball program. Also included is the average seed in tournament appearances for each team. 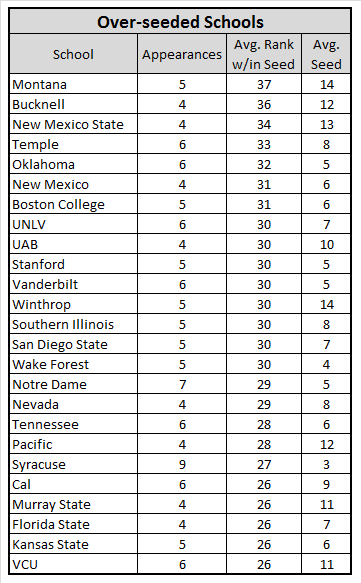 For the “Over-seeded” table, the schools who have a 13+ average seed are likely schools who have unexpectedly won their conference tournament a few times. Disclaimer: You cannot be an under-seeded 1-seed; you’re just a good team.